Kidney Transplantation: A Guide to the Care of Transplant Recipients is an easy to read, up to date, clinical resource written by experts in the field of kidney transplantation. 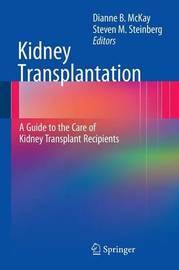 The book explains how donors and recipients are selected for transplantation, how the surgical procedure is performed, and how the experts recognize and treat rejection. Clearly illustrated chapters show how the immune system works in the setting of transplantation and how immunosuppressive medications prevent rejection of the transplanted kidney; knowledge essential for the proper care of the transplant recipient. The acute and long-term care of the patient is described from the perspective not only of proper immunosuppressive medication management, but also from the perspective of comorbidities most common to transplanted patients, including cardiovascular disease, diabetes mellitus, infectious diseases, malignancies, and bone disease. Special issues that impact the care of the transplant recipient, such as unusual donor sources, nonadherence and insurability are also addressed. 13 Illustrations, color; 31 Illustrations, black and white; XIV, 407 p. 44 illus., 13 illus. in color.